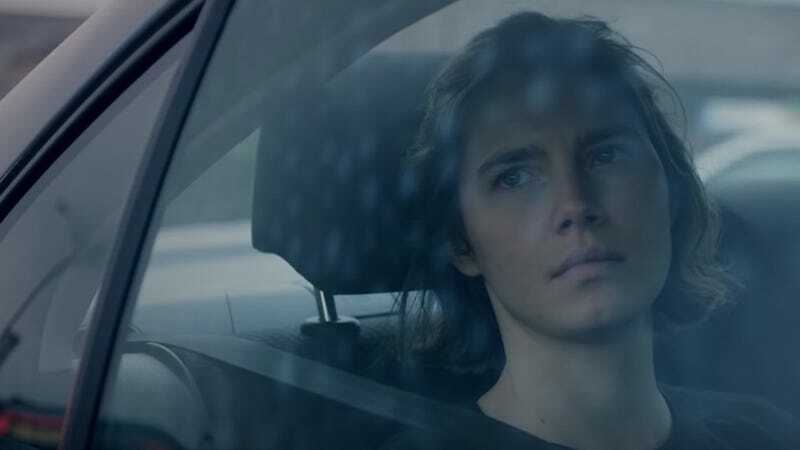 Rod Blackhurst and Brian McGinn’s Amanda Knox, premiering September 30 in theaters and on Netflix, is different from other documentaries in the increasingly popular true crime genre because its subject’s story is already widely known. So what’s the point of telling it again? There comes a point—maybe it’s after a memoir, a Lifetime movie, and nearly a full decade of news coverage—that indulging in the trials and tribulations of Amanda Knox, the American exchange student who was charged with the murder of her roommate Meredith Kercher in 2007 in Perugia, Italy and remained entangled with the Italian legal system until 2015 when she was finally exonerated, begins to feel exploitive in and of itself. Anyone who’s paid attention to the details of the case can presume Knox’s innocence (there is no DNA evidence linking her to the murder) and we can all agree that what she and Raffaele Sollecito (her then-boyfriend who was also accused and charged with Kercher’s murder) went through was nothing short of a living nightmare: They were targeted by public prosecutor Giuliano Mignini (a sensationalist lawyer who nonsensically links his cases to Satanism, while considering himself a modern Sherlock Holmes), mauled by the global tabloid press, and charged and exonerated multiple times while working their way to the three-tiered Italian legal system. But now, both have been found conclusively innocent. Knox is back in her hometown in Seattle, Washington, while Sollecito has returned to his family in Bari. The only questions now lie with the Kercher family (who continues to believe Knox’s guilt), Patrick Lumumba (the man who Knox, confessing under duress, falsely accused of assisting in Kercher’s murder—she later apologized and rescinded the accusation), and Rudy Guede, the man ultimately convicted of the crime. All but Guede (who was represented in the documentary by his attorney) declined or were unable to participate in Blackhurst and McGinn’s film. So again I ask what point there is—besides macabre entertainment value—in rehashing Knox’s story. Knox’s mistreatment by the media and the way her behavior—whether it was her sexual past or her seeming coldness—was scrutinized throughout legal proceedings is certainly worthy of the attention that McGinn and Blackhurst give it (as Blackhurst reminds me in our interview, Sollecito—though convicted of the same crime—was mostly forgotten by the media throughout the trial), but as someone who spends her days both immersed in media and gender criticism, I also worry that the documentary finds its own way to fetishize Knox—whereas before she was painted as a whore, she now runs the risk of becoming a martyr—punished for her curiosity, her sexuality, her love of fun, and her beauty. Indeed, the filmmakers do approach all their subjects—even a buffoon like Mignini—with an empathy that I doubt I could muster in the same situation. Knox, as they show, is eager to get on with her life working as a freelance journalist and advocating for the Innocence Project. Maybe now that her story has been told—and told well—one last time, we can let her.